PCC140060 is a 100 ~ 240VAC, 60W, 1400mA Constant current LED lighting power supply. Incorporating a 26~43VDC voltage range and of a non waterproof design, the PCC140060 is suitable for indoor LED lighting applications. PCC140060 is a 100 ~ 240VAC, 60W, 1400mA Constant current LED lighting power supply. 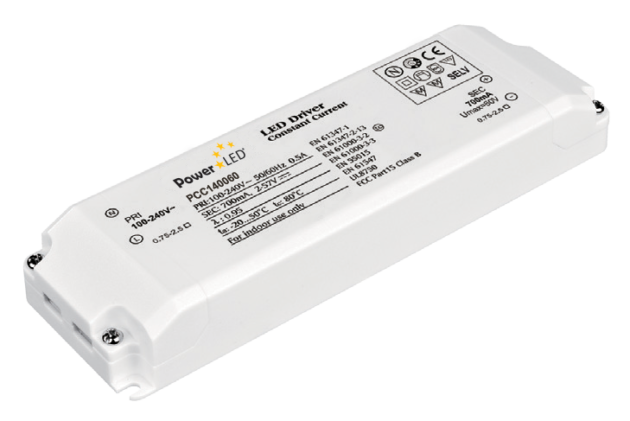 Incorporating a 26~43VDC voltage range and of a non waterproof design, the PCC140060 is also suitable for indoor LED lighting applications. Features comprise of a captive terminal use for easy use and a cooling by free air convection.